Can I Run with a Metatarsal Stress Fracture? In this session we’re going to explain how to decide whether or not you can or should run your race with a metatarsal stress fracture. So this is one of the common questions I get from runners. Most of the time, in fact that was actually the majority of the time that people call me to schedule a remote consultation or a virtual doctor visit, they actually want to know if they can run their race when they have a metatarsal stress fracture. The first thing is that everybody thinks it’s just a crack in the bone that if you look at it on X-ray, if you look at it on MRI, we get a CT scan or something, you’re going to see a crack, that’s not always the case and that’s where the trouble comes in. So it’s just not true. You just have to understand what it means to be somewhere along that continuum of having a stress fracture and then figure out whether that’s really a good idea for you to run. When you think about a stress fracture, again we think it’s a crack in the bone. But it’s just too much stress on the bone that’s really what it is. Yes, in the worst cases if you run on it, you keep pounding, you keep applying the same force it can crack. That’s what everybody thinks if it’s a metatarsal stress fracture. But that’s not what is always going on. Let’s talk about an analogy with the metatarsal stress fracture. I was explaining this analogy of a coat hanger. If you take a coat hanger and you just start bending it back and forth, it will actually heat. The metal gets hot. It actually starts to feel warmer to the touch. That’s basically the equivalent of the first part of the metatarsal stress fracture that is sometimes referred to as a stress response or stress reaction. Basically the bone just heats up. If you get an MRI, you can see that in terms of some bright whiteness within the bone or normally it’s black. So when the radiologist compares it from your second metatarsal to your third metatarsal, with your fourth metatarsal, the one that has the stress fracture actually turns white with inflammation within the bone which we actually said it’s heated up or it lights up. And that’s just an indication that there’s inflammation within the bone because the bone been stressed. But we don’t see a crack most of the time. If you get an X-ray at the same time and there’s some white stuff within the bone, it’s heated up. It may not actually be broken even though we call it a stress fracture. So if you keep taking that coat hanger and you keep bending it, eventually you’ll start to see some opacity in the surface of the metal where it’s actually beginning deform. Keep moving it a little more, it will actually start to crack and then you will see a little surface crack and that’s really what most people think of when they’re talking about a metatarsal stress fracture. Now if you have that level of injury to the bone, it takes more to calm it down than if you have the first level of injury to the bone where it’s just a little bit stressed out. So you have to figure out where you are along that continuum. If you ignore it and you just keep pounding, well that’s not a good idea. If it’s swollen, black or bruised, it’s really like injured, really swollen, really injured and you keep running on it, you can actually break the bone. 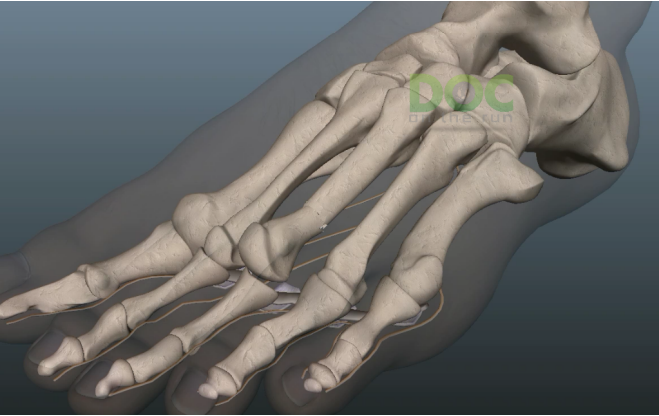 If you break the bone and then it moves out of position, it shifts out of position, then you have what we call a displaced metatarsal fracture. Now that’s not the end of the world. If you’re a runner, we can still fix that. We can put it back in position, put it in a plate and some screws and stabilize it and it will heal and eventually you’ll run again and not having trouble with it. But you you don’t want to get to that point. So when you’re trying to figure out whether not you can run your race, you have to figure out where you are first. Once you figure out where you are then you can try to figure out how to make it feel faster. So the stress fractures is not complicated if you’re applying too much stress to the bone. If you do the same thing that you were doing when you first documented the metatarsal stress fracture, well it’s probably not going to get better. It’s complicated. If you keep running on it, doing the same hills, doing the same runs, what you were doing that caused injury in the first place, it’s predictably going to get worse. So the first thing you do is remove the stress. That doesn’t necessarily mean to stop running. That’s what most doctors sa, “Quit running.”. I wouldn’t tell you to do that. What I would tell you is that you need to get your threshold for that stress low enough that you can actually continue to run and still allow the bone to heal. So that’s the main thing, you just want to reduce the stress. Offload it. Take the pressure off of it. Change your shoes. Do something different. Change the types of run you’re doing. Change the side of the street when you run. Try something to try to reduce the stress and then if you can add up the reduction in stress and remove all that stress then that allows you some more stress you that you can pull out to your bone when you run and still keep under threshold for healing. So that in my mind is always the goal to try to get you to your goal race intact. Every runner when I do a remote consultation or I see them in person, I always ask what is your goal and the goal is not to get the pain go away. The goal is to do Ironman Canada on this specific date. Goals to do the Houston marathon on this particular day and generally it’s within a certain time. So if your foot still hurts, you’re doing the race, you’re not going to run within your time. But if your goal is just to finish the race because you’ve been training for a year for you first Ironman or something like that. Maybe it’s worth doing the race even if it does hurt a little bit as long as you’re not going to really make it worse and causing permanent damage. So the first thing is that you have to really figure out what your goal is, what your goal is, your goal timeline and that is where the standard of care in medicine fails runners. Your doctor generally doesn’t ask you what race you want to do and how fast you want to run on that day that’s. When you go see your doctor you have to explain to them “I’m going to do this race and I’m going to do it on this day and I want to run this fast and your job is to help me figure out how you can get me there intact into the finish line on time.” That’s what what we call success. You have to figure that out. Now let’s talk about a couple of examples. So let’s say you got a stress fracture in your foot and you’re a year out from your goal race. You’re doing the Boston marathon a year away. That’s simple. You have a lot of time. So if you’re doing the Boston marathon, you probably want to run really fast in that race and have a good Boston marathon time. In that case most of the time what I would suggest to people is like really trying to protect it initially. I really try to get that thing to calm down. Get a little bit of time to experiment so if you do some simple things to reduce some stress to the bone and it starts to improve and then you start adding in some runs and it doesn’t swell anymore. It doesn’t bruise anymore. It doesn’t hurt anymore or it continues to hurt less, you’re on the right track. You can continue to run, continue to maintain your fitness and then gradually ramp up your training for your goal race a year out. Second scenario is where you have about four months out before your race. So that’s another common scenario is you have in injury about four months off your race. But this is tough because if you take the normal four to six weeks off which is what most doctors are going to you to do and you sit around for a month, a month and a half then you only have really like two-and-a-half months to ramp up again if you’re training all the way back up to your maximum fitness and then taper before your race. I think it’s really unrealistic to do that. You have a four-month scenario and you have a metatarsal stress fracture and your timeline and your goal is really four months away, you need to try to work real hard and make sure to decrease the inflammation around the bone, get the bone to calm down, see how much better it feels and then immediately start reinforcing your training, maintaining your fitness, trying to run to keep your fitness while also working to reduce the stress as much as possible to that specific bone so that you can continue to run and maintain your fitness. The third scenario, we’re going to talk about is when you’re about six weeks out from the race because this is actually the most runners get injured. You have done your build-up, you come back to have your build-up, you come back to have your build-up again and you’re in your final build phase, maximum amount of stress, maximum amount of pounding, maximum amount of effort, when you have your maximum out of fitness and then you get a stress fracture and it’s really deflating. You get completely disheartened when you are finally just about a month and a half out from the race and your foot hurts, you ou go to the doctors and they tell you , you have a metatarsal stress fracture and you cannot run the race, you need to wear fracture walking boot for the next six weeks. That is really upsetting but that’s just not always true. Again, everybody wants to put people in the same box. They want to say “Okay anybody with a metatarsal stress fracture, six weeks in a fracture walking boot” and I hear this every time I lecture two physicians at medical conferences. I ask them what would you do with this metatarsal stress fracture and I have one up on the screen and the doctor raise their hand and say “Well six weeks on a fracture walking boot” and I would say “Any ideas?” and then somebody will say “Well maybe you could do four weeks”. Okay still, four to six weeks, what’s the difference? it’s still a month or month and a half in a fracture walking boot where you’re going to lose all your fitness. You’re going to lose tons of fitness. 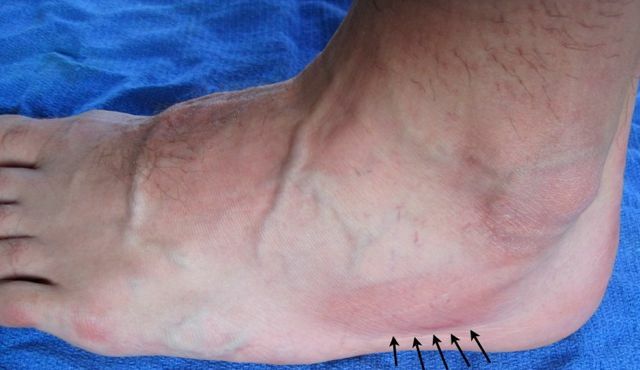 In one week on crutches and a fracture walking boot you will lose seventeen-percent of the muscle fiber diameter in that leg. You can’t afford to do that and in six weeks, it’s sixty-percent. You can’t afford to lose sixty-percent of your fitness and run a race. That’s crazy. That’s what you have to really think about if that’s the case then what do you have to do is you have to maintain your running fitness. The advantage when you’re about six weeks out is you have lots of fitness. You put in a lot of work. You’ve done the overwhelming majority retraining when you’re almost at race level fitness. So as long as you can get past the sort of psychological deflation of being injured when you’re six weeks out, you can experiment and do something strategically to decrease some of the stress of the metatarsal and then do some cross-training, a little bit of other things to support your running fitness without applying as much stress to the metatarsal. 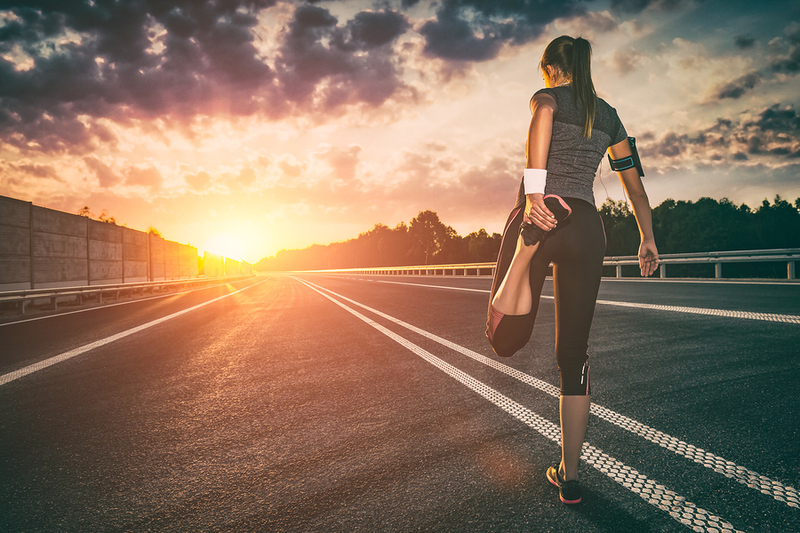 If you can do those things, then you can maintain your fitness and you continue to run particularly if you have one of the early phases of a stress fracture. It’s really just the stress response. Yes, that’s the thing is you have to check in figure out whether or not you really have a stress fracture, how bad the stress fracture really is compared to just a stress response versus a true stress fracture or a displaced metatarsal stress fracture and if you’re in that early continuum of problems with your metatarsal stress fracture. that’s really just the stress response or a stress reaction. Just calm down the inflammation. Take the pressure off the bone a little bit so that you can continue to run, maintain your fitness and then do your race. I’ve done that to myself. I have done that with lots of runners. It’s not that complicated. We created a whole course that shows you how to do that. But it’s not really that difficult. All you need to do is experiment to try to figure out whether or not you can continue to run to maintain your fitness so you can do your race successfully. Now regardless of your timeline, regardless of your goal, one of the tricks with this is you have to monitor what’s going on. 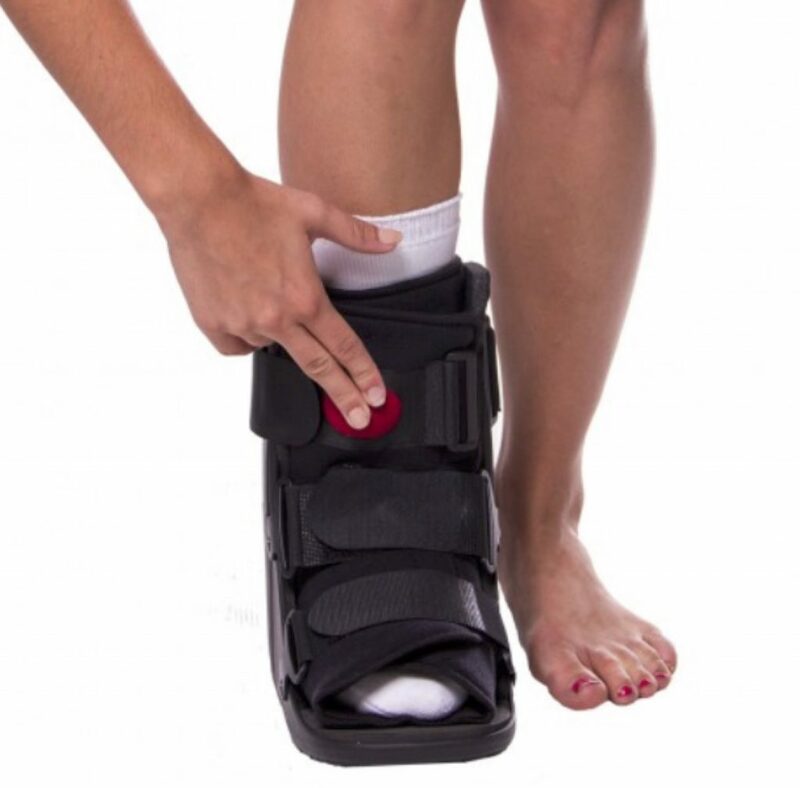 You really have three things that can show you whether or not you’re getting better or worse and obviously the goal here is to get the metatarsal stress fracture to improve. You want your symptoms going down and the sooner the symptoms are going down, you want your activity to go back up and you don’t want your cross your threshold for re- injury again. So you have three things that tell you whether or not you’re improving or not, whether it’s really bad or not. The worst thing is bruising. So if you see any bruising, that’s a horrible sign that means something is cracked, something is torn, something is ripped, something is bleeding under the skin. That’s a bad sign. So the first thing is make sure you don’t have any bruising. If you don’t have any bruising. The next thing to look for is swelling. If you have swelling usually you have like a little puffy, you can really see the extensor tendon kind of disappear a little bit. When you’re looking at them out when you’re just looking down on your feet. So if you do some things to reduce inflammation and that swelling goes away, you know you’re on the right track. If you start running and you take a little bit of pressure off the metatarsal and that swelling doesn’t come back. you know you’re on the right track. Then you know that you can continue to ramp up your fitness, ramp up your training, continue to maintain your fitness and then make it your goal race without any trouble. The third thing is pain. This is completely disregarded by most runners. I mean you track your training, you download everything where you track your fitness, your chart it, you track like how you felt during your run, what you’re perceived exertion was and known. One of the most useful tools for any runner who’s trying to finish a goal race when they have a metatarsal stress fracture is to keep a pain journal. You keep a pain journal can go to the website. It will actually show you exactly how to do it. I created one for you, you can just print out, it’s free, go get it. But basically all you have to do is track your pain. Track what run you were doing,how much it hurts. Afterward how much it hurts the next day. As long as that pain is trending down, you know you’re on the right track. If you’re pain starts turning back up then you need to look at what you’re doing that’s applying stress to that particular metatarsal. The whole name of the game here is to take the stress off of the metatarsal so that it continues to hurt less, swell less, bruise less. All of those things, they give you an indication that it’s improving. As long as you do that you can keep ramping up your fitness so that you can continue to get better and the last to think about is all of those factors that you’re probably not really thinking about, they can also help you heal faster. You need to sleep, you’ve got to rest if you want to recover. So you really want to sleep particularly after days when you do anything that really stresses that particular metatarsal. You want to hydrate. You also need to take probably nutritional supplements that have a calcium, collagen, all of those things actually go into healing any metatarsal stress fracture. You really want to think about like what do you need. You need collagen, you need vitamin C, you need to have those in certain combination if you really want to heal. You should also have turmeric to decrease inflammation. You have to talk to your doctor if you’re taking any nutritional supplements. But all those things, copper, all those can help. These are all things that actually go into healing. Any structure made a collagen and into the early phases of stress fracture then you have to have those things in your system. If you’re going to heal you need a protein in your diet. You need to have antioxidants, you need to have a really healthy diet. The same healthy diet you maintained the whole time when you’re really focus on training. You really need to focus up on that when your healing. It’s the same thing. The only difference between an injury and training is that it’s the severity of the tissue damage. When you get an overtraining injury it’s just more tissue damage than you wanted. But when you do train you cause tissue damage and that tissue damage is delivered. That’s why get stronger, you rebuild the tissue. You’re just rebuilding on a bigger scale right now when you have an injury. Monitor all those things, think about your nutrition, think about your sleep, think about emotional stress. They called a stress fracture remember. So if your boss is a jerk, if you’re having all kinds of marital discord at home, try to do something to be nicer. Try to do something to be happier. Meditate, do whatever you need to do to reduce that overall stress. That’s really the key when your healing a stress fracture. It’s the global amount of stress. There’s only so much energy to go around and you’re not going to heal if you’re stressed out, worked out, overtired. All of those things. You really have to make sure that you put the effort into the mitigating all these other little stressors that can contribute to the injury and prevent your healing. The other thing is creative fitness. I’m not going to tell you, you just have to ride a bike. You just have to swim but you need to be creative you need to do everything you can to maintain your fitness while supporting that injured structure. So if that means you’re doing some other workout to the gym to build your glutes and hamstrings and your core. Some of the things you might sort of put on the side while you’re really ramping up your mileage for your key race. All those things will help. So if you do these other things that will help but will not stress your metatarsal, those things will really help to put you on the fast track to healing. In summary the name of the game here is to just reduce the stress of the injured structure, reduce the stress of that injured metatarsal. Take some pressure off of that injured metatarsal in a way that’s going to allow you to continue to train without as much force on the metatarsal so you can continue to heal even while you run. If you do those things and you monitor it and your pain is going down, your pain is decreasing, the swelling is going away, you’re keeping the swelling under control with some measures to really control the inflammation like contrast baths, compression socks and you’re getting better then you should be able to continue to run. There’s no reason for you to sit around in a fracture walking boot if you just have a stress reaction or a stress response. And you’ve decided that’s what you really have. So if you have a displaced metatarsal stress fracture and you can see it on the X-ray, it moves when you push on it. But that’s what you need to talk about these things with your doctor. You really need to make sure that you know what your goal is, you know what your timeline is and you really force that upon your doctor so that you can work together to decide. Is it reasonable for me to run or not? Can I do do these things and still heal or not? But your doctor’s only thinking about healing the bone. The doctor’s not thinking about your race and the doctor’s not thinking about your goal time. That’s your job. So make sure you tell your doctor, make sure your doctor understand exactly what you expect and how you will define healing. «« Can I Run with Plantar Fasciitis?